I studied recorder at the Guildhall School of Music & Drama under Pamela Thorby after completing my degree at Bath Spa University. 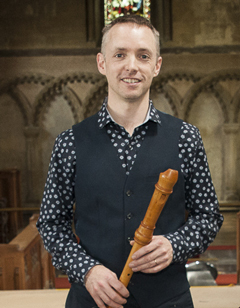 My own ensemble Sociall Musick were finalists in the 2003 York Early Music Competition, and I perform regularly as a soloist with The Welsh Baroque Orchestra and Bradford Baroque Band among others. My teaching work has been with students at The Royal Welsh College of Music & Drama, Bath Spa University as well as in masterclasses, workshops, schools and private tuition. I also make early stringed instruments from my home in Wiltshire. See www.owenmorse-brown.com for more details. Below you can see a performance of Telemann's Suite in A minor for recorder and strings performed with the Welsh Baroque Orchestra.